Scotland’s road maintenance squads and plant hirers have been called into action to tackle the effects of the high winds and heavy rain that have swept across the country. “This weekend’s amber alert from the Met Office – the first of this winter – is another timely reminder that we are now moving into winter proper, and all of the sudden changes poor weather can bring,” warned transport minister Keith Brown as he chaired a meeting with Transport Scotland, local authorities, Police Scotland and SEPA to assess conditions. Disruption was felt particularly in the north west and the A82 felt the full weight of the torrential rain. The road south of Fort William was reopened on Monday after it was blocked by two landslides on Sunday, trapping a number of vehicles and their occupants between the two locations for five hours. 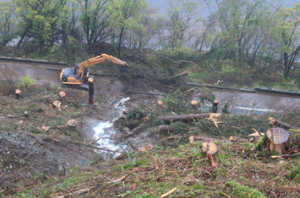 Teams from road management company BEAR Scotland, its sub-contractors and Forestry Commission Scotland worked through the night to clear debris and trees. The road was partially re-opened on Monday morning before opening fully later in the day.